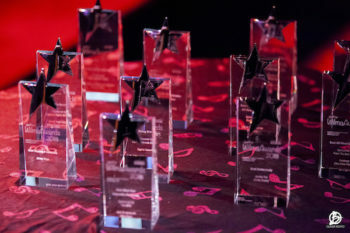 Was it really a whole week ago that we held the 5th West End Wilma Awards?! I am only just starting to process the whole thing now I am back home in Paris and can enjoy some time to breathe. The Wilma Awards takes at least six months of planning and so it is a mammoth task which I always insist I will never do again, but after it’s all over and I see how well it all went, I always change my mind! For the 5th year, we moved the ceremony from a Friday lunchtime to a Sunday afternoon which meant the nominees could come and relax on their day off and more of the theatre going public could come along too. We more than doubled the size of the audience this year by holding the event at the Arts Theatre (350 people) and the place was packed! Thank you to all my sponsors, without which this show wouldn’t have been able to happen. R&H Theatricals Europe, Royal Vauxhall Tavern, Theatrical Rights Worldwide, The London Cabaret Club, The MTA, Becky Barrett Management (BBM), From The Box Office and SeatPlan. A special thank you to our overall sponsors Free@LastTVLtd and to Martina Cole who not only sponsored an award this year but also sponsored our drinks reception! I must thank our host for the 5th year, Tim McArthur, plus Ollie Boito for the photography and Alexander Bermange for the Musical Direction. Huge thanks to Nathan Matthews for the technical support on the day and to Pete Cowell for overseeing the event when I wasn’t around. Thanks to Sister Mary McArthur for opening the show and getting the audience going with a few songs from Chitty Chitty Bang Bang, The Sound Of Music and of course, Baby Shark! Plus Sooz Kempner, David Hunter and Evelyn Hoskins for performing and our guest presenters Marisha Wallace, Ben Adams, Christina Bennington and Jordan Luke Gage. Most importantly, congratulations to all of the nominees, everyone is a winner and there were a whopping 50,000 votes cast this year making it the most popular year yet. I hope everyone who came along had fun and I look forward to doing it all again next year!